DDoS Testing and DDoS Simulation | RedWolf Security Inc. Looking for realistic threat simulation? 200 of the world's biggest brands trust RedWolf! The most comprehensive, safe, and feature rich threat simulation platform available for enterprise. RedWolf's next-generation platform is trusted by hundreds of Fortune 2000 companies. With it you can safely validate your defense performance, improve alerting and detection, calibrate mitigation systems, optimize operational responses and confirm SLAs and controls. #1 provider of Threat Simulation for Fortune 500 companies since 2006! Outage free testing: Precision real-time control & feedback systems DDoS testing: Over 300 DDoS scenarios: TCP, UDP, ICMP attacks, IPV4/6, HTTP, DNS, SSDP, SMTP, NTP, IPSEC, GRE & many many more Load testing: Real users, API testing, mobile-apps Device testing: Targeted: Firewalls, WAF's, IPS, Load Balancers, DNS Servers, and more Build repeatable test-library. Full API for automation. Over 200 internal threat scenarios: Data Leaks/DLP, Gaming, Chat, Content, Insecure Protocols, Malware, Advanced Persistent Threats & many many more! Scenarios cover over 90% of all Insider Threat cases. Monitoring: Netflow, Packets, Web, DNS, TCP, ICMP, SMTP, SNMP, Traceroute, BGP, and more. Traditional security operations are no longer practical. 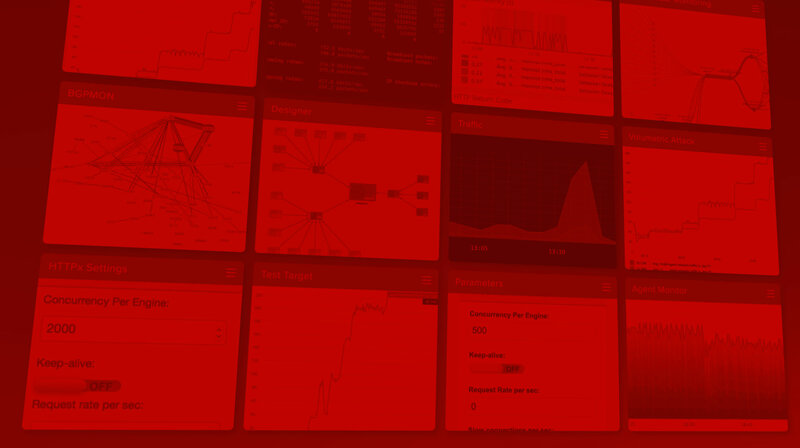 RedWolf offers an exciting program and platform to transform security operations. visually manage your KPI's, incident response procedures, runbooks and align them to the technology and data. RedWolf can analyze your servers and build a world-class reusable test library. We began RedWolf testing 3 years ago. Our complex, layered defence systems are managed by multiple teams and need to function as a single defence system. Using RedWolf we have verified that historic weaknesses in both process and technology have been significantly strengthened. Our critical stakeholders are very pleased in the demonstrably improved capabilities of our cyber-defence systems. One Million HTTPS Requests/sec? No problem! RedWolf Hardens Cloud Infrastructure to Record Levels! July 2018 New Web Site Crawler Scenarios!